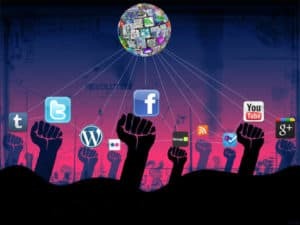 Does Social Media Enhance Activism? We all know that throughout history, in times of hardship and political strife, activism has been an ever present reminder that people do care and want to make a difference. But what about the person who sits at home shouting at the news, the one that donates $5 over the phone or more recently tales action over the internet? Are they activists and what effect has Social media and the internet had? Have you ever signed an online petition, shared something on a social network or watched and shared a YouTube video that is cause orientated, or changed your Twitter or Facebook status or avatar in support of a cause? If so you may be a Slacktivist, the term given to people who try to make a difference without having to leave the comfort of their own home. We all watched Invisible Children’s ‘Kony 2012’ Video; it is considered the most viral video of all time and has prompted numerous discussions about the power of slactivism to drive real change. Saying this, maybe we should give slactivism another look and see the difference it can make. If we look at protests that have gone on in 2008, 12 million people marched against the Revolutionary Armed Forces of Columbia after it was organised through a Facebook group. A different platform was used in California when 40 000 high school students participated in a mass walk out, in protest of immigration laws, the protest was organised via texts and MySpace. Other examples of success is the of Video; there were 50 million views on Barrack Obama’s presidential campaign (some argued the way he tackled Social Media as a campaign tool, won him the race), while the Kony 2012 video had 85 million views as of the 26th of March 2012. Social media has had further success with spreading the news of a particular issue and getting everyone one the same page. While the crisis was going on in Egypt, leading up to Mubaraks resignation, there were 230 000 tweets a day regarding this issue. The US government has also seen the value of slactivism in that on 12th June 2009 it asked Twitter to delay a scheduled maintenance due to the importance of the platform during the Iranian election that night. Change.org has also had success with petitions as it got 300 000 signatures protesting the Bank of America’s debit card usage fee, subsequently the Bank of America soon cancelled the fee plan after so much online pressure. Slacktivists have also been able to raise a lot of money for donations; $38 million was raised by the Red Cross during the Haiti disaster simply by sending in a sms. 91 Billion grains of rice were donated through the World Food Programme for Freerice, by individuals simply playing a game online and every answer = 10 grains of rice. So if we just take a moment to look at some of the facts and realise just how powerful Social Media and the internet is it may become apparent to us that the power of Slacktivism does indeed exist. On that note, we should really take notice and next time we think that liking a status can’t make a difference…maybe it can. Cale is a social media manager who enjoys reading about social media, SEO and political activism.